The TV world is in mourning once again, with a new report confirming that Earle Hyman, best known for playing Bill Cosby's father Russell Huxtable on The Cosby Show, has passed away at the age of 91. The actor passed away on Friday at the Lillian Booth Actors Home in Englewood, N.J., which was confirmed by his nephew Rick Ferguson. It isn't clear if there will be a public memorial service for the actor at this time. 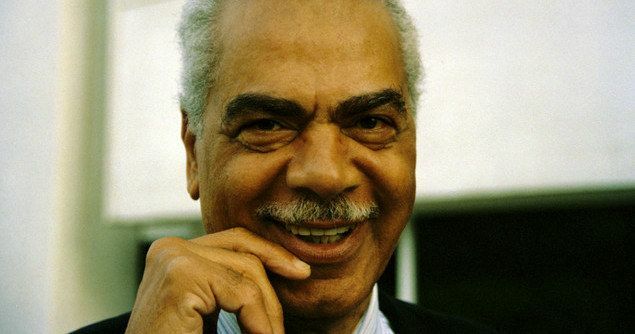 Earle Hyman was born on October 11, 1926, in Rocky Mount, N.C., the son of schoolteachers who had both Native-American and African-American roots. He was raised in Brooklyn and began his film career with an uncredited appearance as The Smoking Man in the 1945 Oscar Best Picture winner The Lost Weekend. A year earlier, the late actor made his Broadway debut in Anna Lucasta and appeared in hit plays such as The Merchant of Venice, No Time for Sergeants, Mister Johnson as the title character, Saint Joan, which he actually starred in twice, less than a decade apart, an all-black production of Waiting for Godot, Les Blancs and in Henrik Ibsen's The Master Builder, opposite Lynn Redgrave. He was such an admirer of Ibsen that he took a vacation to Norway and ultimately owned property in the country. Here's what he had to say about Norway in a 1988 interview. "The only place I'm a star in the true sense of the word is Norway. There they come to see me and hope the play is all right. I'm the only foreign actor and only black actor who performs in both Norwegian languages." Throughout the 1950s and 1960s, the beloved actor guest-starred on many TV shows such as Camera Three, East Side/West Side and The Defenders. He also had roles on the big screen in the war film The Bamboo Prison (1954), Afrikaneren (1966), The Possession of Joel Delaney (1972) and in the crime drama Fighting Back (1982). In 1984, he landed the role of Russell Huxtable, the sage-like father of Bill Cosby character Heathcliff "Cliff" Huxtable, appearing in 40 episodes spread out through all eight seasons of the iconic sitcom. He also reprised that role in one 1987 episode of A Different World. He received an Emmy nomination in 1986 for outstanding guest performer in a Season 2 episode of The Cosby Show titled Happy Anniversary, where the family plans a party for Russell and Anna's (Clarice Taylor) 49th wedding anniversary. Here's what the actor had to say about that memorable episode, which featured the actor lip syncing to Ray Charles, in a 2009 podcast interview. "That's the one episode that was the most loved, most seen. People just loved it. It just shot off the charts. We just had a ball, and the atmosphere just went over into a kind of reality. We were no longer Clarice and Earle, we were really Anna and Russell Huxtable." Aside from The Cosby Show, the actor's other best-known role was voicing Panthro, Red Eye and a number of other characters on the hit animated series Thundercats, working in 125 episodes between 1985 and 1989. After The Cosby Show went off the air in 1992, the actor's appearances in film and TV were rather scant, appearing in a 1996 TV movie called Hijacked: Flight 285, a 2000 TV movie The Moving of Sophia Myles, a 2001 guest starring spot on Twice in a Lifetime and his final performance as an uncredited spectator on Saturday Night Live in 2015. The actor is survived by nieces Cassandra, Yvette and Monica and nephew Derryl. The death was reported on by The Hollywood Reporter over the weekend. Hopefully we'll have more details on the late actor's death at a later date.